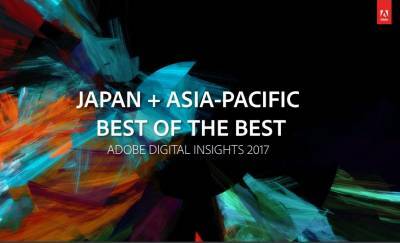 A new Adobe Digital Insights report – Best of the Best JAPAC – has been released that highlights the internet usage trends demonstrated by consumers in the developing countries and the role played by smartphones in driving new internet users. The report leverages Adobe Analytics to aggregate anonymous data from 100 billion visits to more than 3,000 websites in Asia, including 16 billion visits from India. It presents the average and top performing benchmarks across industries, including Retail, Media & Entertainment, Travel & Hospitality, Financial Services, and High Tech, and looks at parameters such as share of smartphone and desktop visits, stick rate, conversion rate and minutes per visit among users. “With the growing smartphones penetration, consumers are establishing their digital presence and gaining more opportunity to interact with brands. Brands that adopt mobile strategy and offer a compelling and consistent customer experience are driving better business results and will continue to maintain a lead over the competition,” said Becky Tasker, Senior Managing Analyst, Adobe Digital Insights, ‎Adobe. “India is on the verge of becoming a digital-first nation and as smartphone adoption levels increase. In times like these, where opportunities for digital success are in abundance, the need to constantly evolve or provide value has become vital for brands,” added Tasker. Volume in smartphone traffic is growing in India across all industry sectors, but grew fastest in Retail with 45.3 per cent average year on year growth, followed by Media & Entertainment sector at 39.2 per cent, and Travel & Hospitality at 34.4 per cent. Gaps in smartphone traffic widened dramatically between the best industry performers in the Finance sector as well as Media & Entertainment. Leaders are pulling away to capture higher share of traffic versus their competitors. In this respect, the best performers in Retail had the greatest gap between the best and the rest, with smartphone share totalling 67.8 per cent. Top performers in Media & Entertainment sat at 53.0 per cent. Top performers Finance recorded a much lower performance of 22.1 per cent, suggesting there’s still room for fast-moving and innovative players in this sector to attract customers post-demonetisation phase in the country. Desktop share of visits were down YoY in every industry except for Finance, indicating consumers in India continue to access financial content on the desktop device. Desktop share of visits in Travel & Hospitality and Retail sector decreased the fastest in 2016. Mobile optimisation is playing a big role in helping consumers complete their digital needs faster, reducing their overall online time. This underscores the pressure on brands to get it right the first time, by driving innovative and personalised online engagements. Social media platforms such as Twitter and Facebook have become an intrinsic part of consumers’ daily lives providing multiple touchpoints for brands to deliver an enhanced experience. The report highlights that Twitter has been embraced by brands across industries and Instagram has gained more adoption year-over-year as compared to other channels. Adobe Marketing Cloud is an integrated digital platform that empowers companies to use big data to effectively reach and engage customers and prospects with highly personalised marketing content across devices and digital touch points. Eight tightly integrated Solutions offer marketers a complete set of marketing technologies focusing on analytics, web and app experience management, testing and targeting, advertising, audience management, video, social engagement and campaign orchestration.